Live Your Faith at School . . .Get Equipped! Register Now . . . to receive periodic inspiration, the latest news and information from LIFE. We so appreciate each of our LIFE SPONSORS !!! For more information, please contact Dr. Gayle/Myrna Brogdon, LIFE Directors, Email Us! On Sat., Dec. 1, 2018 the 41 attendees at the LIFE Christmas Party Brunch enjoyed the food, fellowship, white elephant gift exchange and the faith-filled message, “It’s Gift Giving Time”, by Ron Corzine (LIFE Bd. of Directors). Visit the gallery here. This event was held Sat., Oct. 13, 2018 at the home of Dr. Gayle/Myrna Brogdon, LIFE Directors. To the 55 attending, Gayle & Myrna shared their inspirational testimonies in the message, “Rise to Your Calling: Reach Others!” We praise God for the two who received Jesus Christ as Savior! In addition, Dr. Kathy Bussert-Webb (professor at UTRGV) and Mary Rodriguez Vela (middle school teacher at Weslaco ISD) shared how God used Dr. Brogdon to reach out to them and impact their lives spiritually. LIFE BACK 2 SCHOOL BRUNCH! This event was held Sat., Aug. 4, 2018 at the home of Dr. Gayle/Myrna Brogdon to “kick off” the 2018-2019 school year. Visit the gallery here! Ron Corzine (from Ft. Worth, Texas and LIFE Bd. of Directors) encouraged the 65 attendees with the powerful and inspirational message, “Reach, Rescue, Return”. In addition, there was a time of prayer for the schools as well as personal prayer. 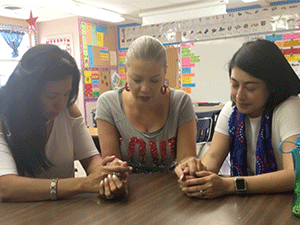 LIFE began in 2017 a prayer endeavor–Lift Educators Up–where a Christian prays for an educator specifically by name and position throughout the school year. Both sign up to participate with the page administrator pairing them. Christians and educators worldwide have signed up, been paired, and are praying. If you would like to participate, go to Lift Educators Up and sign up or contact us by email! START A LIFE EDUCATOR CONNECT GROUP! It is a time for educators to connect with the Lord and one another. This small group meets to pray, to study, to share, and to support one another in their Christian lives. Meetings are held during non-contractual time prior to/after school or during lunch.